The pitfall with most haircare lines is that they're designed to address one overarching concern, like volume or smoothing. But most of us don't just have one hair concern, do we? For example, fine locks can also be prone to frizz or require extra care because they've also been colour-treated, so they'd require smoothing and repair products, not just volumizing ones. Therein lies the genius of a tool like Stylist Selections. First, you answer a quiz about your hair type, condition, routine, and main concerns. Based on your answers, Stylist Selections looks across all of John Frieda's haircare collections to find the perfect product recommendations for you. 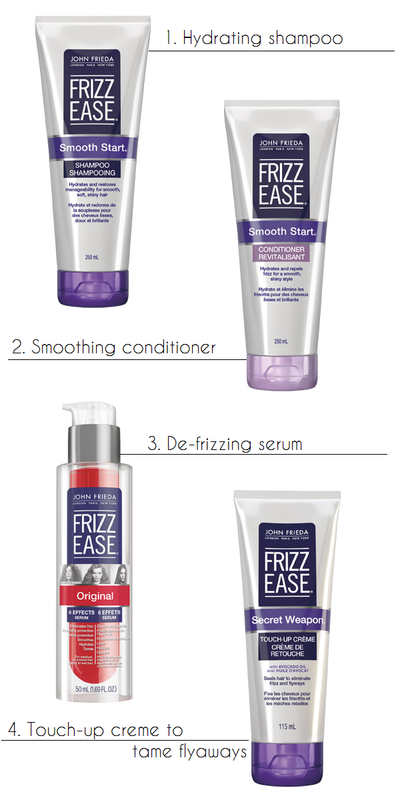 I ended up with 4 products that would give me smooth, frizz-free locks with minimal fuss, and I've been test-driving my new John Frieda haircare regimen ever since. To start off on the right note, I lather up in the shower with John Frieda Smooth Start Shampoo and Smooth Start Conditioner. Both formulas smooth and hydrate locks without weighing them down too much thanks to a blend of moisturizers and silicone and rinse away cleanly. Next, I towel-dry hair and work 2 pumps of John Frieda Frizz Ease Original 6 Effects Serum into the ends, thereby coating each strand with more moisturizers and silicones. I blow-dry my hair until it's slightly damp to the touch. Finally, I work a pea-sized dab of John Frieda Secret Weapon Touch-up Creme between my palms and lightly smooth my hands over my hair to tame flyaways and de-wispify errant bangs. So how effective was John Frieda Stylist Selections in predicting my hair needs? Well, like many women, normally I'd wash my hair and have to wait a day for it to normalize because I prefer the texture of second-day hair more. But with my John Frieda Stylist Selections, I have hair like this straight out of the shower. No straightener, not even a complete blow-dry (I let the damp ends air-dry). My John Frieda Stylist Selections are not the be-all and end-all of my hair routine. I use a clarifying shampoo and conditioner periodically to rid my hair of all the heavy silicones and a weekly hair mask does wonders. But given the effectiveness of the products and their affordable price points ($10-15 a pop at drugstores like London Drugs), I'd say these Stylist Selections were spot on. Will you be trying the Stylist Selections tool? I'll check out the tool for fun, and btw I love your coat!!! Looks s fashionable and cute! Thanks Emi! The coat's from Bootlegger. Thanks, Cath! I'm all about low-maintenance hair myself.